Cycas circinalis known as Queen Sago Palm is not really a palm at all, but is a Cycad, a living fossil that has changed little in the past 200 million years. Cycads are related to the cone bearing conifer and ginkgo trees. Cycads can be used as house plants, or they will grow outside in full sun to some shade, with a bit of palm fertilizer added during the growing season. Do not transplant them when new fronds are emerging. Propagation is by pups set at the base of the trunk, or they generally produce seed every other year that can be used. Problems include frazzle top caused by a magnesium deficiency. To remedy, spray the leaves with manganese sulfate once a month for three months. 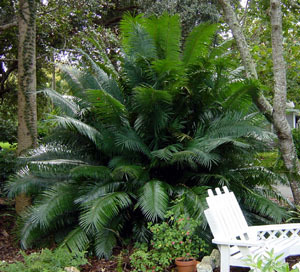 Another problem is white cycad scale, which can be treated by spraying a horticulture oil on the fronds. I've also read reports of success using Hartz Flea & Tick Killer for HOME. Don't use the one for dogs as it's too strong. Cold damage is another problem as cycads are cold hardy to only 55 degrees F. Cycads can have a long life, as much as 80 years or more. On a personal note, I inherited two large queen sago palms when I bought my house here in Florida. I transplanted one that was 4 feet high and it responded quite well. It's still going strong in spite of the ongoing battle with scale. The other was larger and in worse condition. It was in a bad location, but too large to move, so I made the tough decision to chop it to the ground to make way for other plants that looked better. I was later shocked to see new fronds appearing like magic from the presumably dead stump. Now I see why they've been around so long. For me, the best thing about cycads is the knowledge that they were around before and during the reign of the dinosaurs, making them a true living fossil.